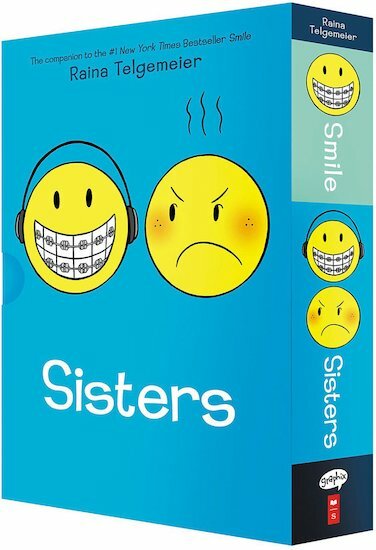 This special boxed set contains Telgemeier’s #1 “New York Times”-bestselling and Eisner award-winning graphic memoir “Smile” and its companion, “Sisters”. Raina wants to be a normal 12-year-old. But when she trips and falls, severely injuring her two front teeth, she begins a long, frustrating journey with braces, surgery, hideous headgear and even a retainer with fake teeth attached. And on top of all that, there’s a major earthquake, boy confusion and friends who turn out to be not so friendly. Raina can’t wait to be a big sister, but once Amara is born she realizes things won’t be quite what she had expected…or hoped. Despite Amara’s cuteness, she is a cranky, grouchy baby and mostly prefers to play by herself. Their relationship doesn’t improve much over the years but when a baby brother enters the picture and their parents’ relationship starts to struggle, they realize they must figure out how to get along. They are sisters, after all.